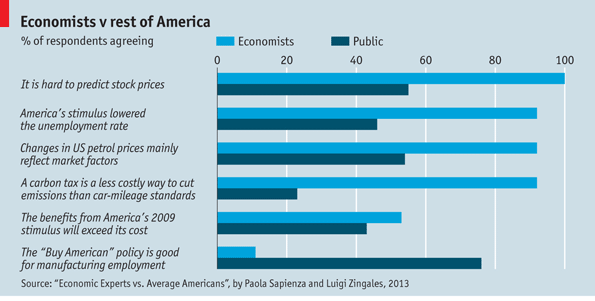 The American Human: Are Economists Dumber than Average Americans? Uh, no, but that's beside the point because average Americans think they are. A paper recently introduced at a major economics conference -- the American Economic Association -- demonstrated that average Americans differ markedly with economists on a range of issues, none so vivid as with trade. I learned of this on Noah Smith's blog Noahpinion, where many an economic idea or controversy is artfully and entertainingly discussed. Noah is rightly intrigued by this paper, by Paola Sapienza and Luigi Zingales, entitled "Comparing Beliefs of Economists and the Public," in which it becomes obvious that the average citizen doesn't think much of economists' notions or expertise, treating them more like zany, out-of-touch Zen masters than people with relevant ideas. I don't agree, but there's nothing more emblematic of our time than the average citizen's contempt for experts, especially in the area of money and spending and counting and predicting based on it. The average citizen thinks, "I'm broke, I'll stop spending. Why doesn't the government get it??!!?" Of course, what the average citizen forgets is that most of us are in hock up to our eyeballs already, with mortgages, car loans, and credit-card debt, and are in no position to criticize. Plus, they also forget that governments don't function like households, and they also forget what they don't know yet, which is, unfortunately a lot. But I digress. The sharpest difference between the "expert" economist and the average American, according to Sapienza and Zingales' data, is in the area of trade. Most economists agree that free trade is superior to managed trade -- or protectionism, if you will -- because although free trade can have deleterious effects on certain industries, especially in developed nations with a heretofore higher wage structure, in the long run winners and losers in free-trade battles will both win in eventual absolute terms. Or something like that. The Old South: Talk about cheap labor. The average American thinks differently. If the American South used to have a robust textile industry that was decimated by the availability of cheaper textile goods from Asia, then the average American would conclude that our government should have prevented that from happening, should have "protected" us from this consequence. The New South: Atlanta tech CEOs ring the opening bell. An economist might see a bigger picture, one where things would settle down into a set of interconnected comparative advantages among nations and regions. Whereas Indonesia might gain a comparative advantage in textiles because of cheap labor, Atlanta, Georgia, might switch from textiles over time to technology because of our comparative advantage in that area. In fact, this is the kind of change countries and regions all over the world undergo constantly. And if in the end, burgeoning middle classes develop all over the world, then these richer, healthier, stronger economies will begin to consume more, and that consumption might be of technology from Atlanta, Charlotte, Jacksonville, etc. As standards of living rise around the globe, education flourishes and citizens begin to demand more attention be paid to areas like healthcare and the environment, which can only help the collective population of the planet. Do you think, for example, that an expanding middle class will put up with the pollution in China as we witnessed just this week? See the picture below, and, yes, the answer is no. Beijing, January 2013: This is not fog, my friends. Still, I don't expect the average American to take all these things into account. They generally see things only in their own backyards, and it's easier to blame the government, or foreigners, or "libtards" for their misfortunes. Sometimes that can be true, as in Washington's recent failure to include a public option in Obamacare. No, the average American is too busy shopping at Walmart -- buying up a slew of cheap Asian textiles -- to pay attention to trade issues. But they'll still have an opinion about it, even if it runs counter to the way they actually conduct themselves in the regional, national, or world economy. Until and unless education can work to reduce ignorance, or the media begin to understand economics enough to help in this war against ignorance, we can expect the citizenry to continue to march off to Walmart, max out their credit cards, while marching around chanting "Buy American" or "Guvmint get your hands off my Medicare" or "What part of 'stop running up deficits!' don't you understand??!" Good grief. If only ignorance truly were bliss. We're beyond that now, in the Internet Age, where ignorance is, uh, contagious. Attention, Walmart shoppers: Don't forget to stay within your budgets! Note. I don't mean to imply that all information on the Internet is tainted by ignorance. Yes, looking around the comments on news articles, blogs, and Web magazines, there's a lot of intellectual insight demonstrated, though it's often drowned out by hoards of ignorant ranters. I don't like the word rant, feeling it's over-used, but it's apt all too often in comment areas. Oh well. But there's a lot of healthy vitality out there, too, and it's of course why I blog in the first place. Let's keep it up, and fight the good fight. Unfortunately the Bush years saw a rise in the celebration of ignorance and anti-intellectualism. No Child Left Behind did a lot more damage than good, and now our schools are just trying to pick themselves back up. With the fall of education came a media culture that glorifies hot air and shouting vs facts (24 hour news networks for example,) and stupidity vs brains (like the Kardashians and Jersey Shore) over intelligence. You put those two factors together, and you have a population that worships air-headed tv personalities and pop culture icons instead of understanding the importance of being smart. In some cases now, intelligence has even been vilified (which continues to disgust me). I'm not sure how we can once again put smarts on the high pedestal while taking the "reality" shows down a peg, but our culture as a whole needs to undergo a dramatic shift. Myself being in training to be a secondary school English teacher, and knowing other future teachers in various subjects, it seems like the system is undergoing a massive overhaul. Hopefully with it we'll see a change in the media, and people once again trusting experts instead of their guts. I agree, Joyce, that our culture seems to have gotten crude, crass, and coarse, but there's still a lot of good intellectual life being supported online, on blogs of all stripes. So it's possible to live a public life that is full of curiosity and wonder about the world around us. What I've felt about Americans is that we are, for the most part, ignorant of the rest of the world and how people around the globe think, feel, act and process their own lives in their own cultures. It's this ignorance that shapes our narrow American views on so many issues. One of course is education. I spent years as a teacher in the California system, but I mostly worked in jobs teaching, in technology, marketing, digital media, writing, and language. I focused almost all my teaching on critical thinking, leaving a lot of what students were to discover dependent on their own investigation. It worked for the most part. I also pushed self-expression through writing and digital art. I was able to teach in a special alternative small-school setting focused on interdisciplinary collaboration and project-based learning. So I was lucky, and so, I believe, were the students who passed through our courses. Thus, perhaps, I'm more optimistic about our future, especially if bright and aware people like you keep fighting the good fight in our schools. But, yes, I'm deeply disturbed by anti-science and anti-intellectual movements led by conservative politicians, religious leaders, and, frankly, parochial forces in the public sphere, especially in rural areas, southern and plains states. We behind now, but we're breaking out. That's why I write my blog, to spread the idea that we don't have to limit ourselves by being self-absorbed in our own mythologies. The world is big and full of diversity and wonder. Let's investigate and share it while preserving it for those to come after us. Best of luck in the world of education. It's a great place to be and thrive while helping others.It's vital to our civic life.